Nostalgia is a delightful traditional-style dory with sweeping sheerline and ideal for both rowing and sailing. Capacity 3-4 persons. The double-chine plywood construction enormously simplifies the work for the amateur and requires no full-size patterns. 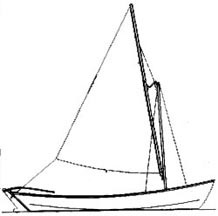 Plans show full details of mast, rigging, dagger board and dimensions of loose footed lugsail are all inclusive.